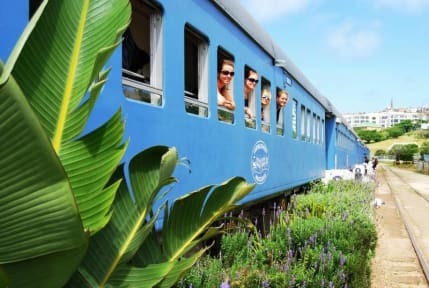 The Santos Express Train Lodge is a genuine train situated on the Santos Beach in Mossel Bay with all cabins facing the sea. With the ocean so close, you can't really beat its unbelievable position and exquisite views. An invigorating sea breeze keeps everything cool even on really hot days. We have 5 coaches, of which 4 are identical, with 5 compartments (2-4 sleeper), 2 coupe's (1-2 sleeper), 2 toilets and 1 shower. The 5th coach is divided into a 16 bed Dorm with lounge and the Caboose - an on-suite room with balcony. Double and single rates include a free continental breakfast. An additional hot breakfast upgrade is available on request at a small extra cost. All Royal suite bookings include a complimentary hot breakfast as well. We can accommodate a max of 114 pax and have special STO rates for groups of 30 pax and more (Low season). Seasonal rates apply. Menus can be customized to suit your budget and requirements. Really cool idea and falling asleep with the sound of waves crashing? Bliss. As was waking up to it. Staff were nice, showers were lovely, location excellent if you have a car (a little far out from the city and restaurants if not). Not much to complain about. The rooms are very small though so if you have a lot of luggage you will struggle! We were in a double room and the bed was lovely, super comfy and spacious, but there was almost no space for luggage. We kept ours in the car. This place is hard to imagine, train carriages in front of a calm ocean beach. The structure is great,with a restaurant and bar attached and the rooms are comfortable and cozy. It has a very calm atmosphere, quiet and relaxing. The place could have been much much more better as far as a hostel goes, while definitely a plus on the ambience and location, it severely lacks on basic facilities(cooking, laundry, refrigerator, etc) which every hostel generally has leading to additional expenses on a daily basis who could have been avoided. Great place to stay at if not on a budget and not a longer stay. Was a very beautiful place and we enjoyed the view! I would recommend letting people know you will need to bring towels, we got there and didnt know and had to go out and buy towels but overall experience was nice and would definitely recommend! 3 older gentlemen (60+) were constantly on the steps leading into our train car smoking. They had to move every time someone wanted to enter/exit. The rooms are compact, just a bed and a tiny table. Hardly room to turn around let alone get dressed. Beautiful view tho! Included breakfast was toast, yogurt and fruit, or cereal, pretty basic. Cool place for a night or two but no backpacker vibe to it. Great location. This hostel/hotel was just okay. The staff wasn’t overly helpful or friendly, other than one nice lady who let me shower after checking out/before my bus came. The rooms were a little smaller than expected but it makes sense due to the type of accommodation. The restaurant served good food at a reasonable price and the beach was a stone’s throw away. 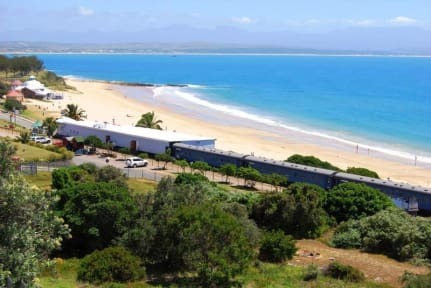 If I came back to Mossel Bay I would probably choose different accommodations. Not really the place for backpackers from our experience! We were the only ones in the dorm train carriage - we found it rather creepy with the dripping tap and no one else about! Also a much older clientele at the bar/restaurant. The staff were helpful though.